I had totally missed it — noticing I ended 2018 similarly to how I began: writing about an attitude of “getting to” do this or that instead of “having to” in both January and December. Maybe once the idea slipped into my psyche, it quietly settled there and began changing my entire outlook from that point forward. I’m a fan and advocate for choosing a Word of the Year, #OneWord that sets a compass point (in contrast to a destination), a trajectory, a direction for life. It’s not a think intended to confine or box you in. On the contrary, it’s liberating. If you can love a word, I loved my entirely-made-up word from last year–OYTO. Sweetly inspired by a tee shirt a friend gave me, OYTO was a fierce battle cry, wrapped opportunity-gifts that begged to be opened. My intention stirred awareness that led to results. Simply put, I saw things differently because I wanted to see things differently, and that affected how I responded. The same is true for being a Get-to Girl. Shifting my attitude from having to do everything — even needing to do anything — gives me a sense of control because I understand I have a choice about my attitude. Necessary chores that could potentially seed resentment, martyrdom, or leave you feeling taken for granted suddenly become opportunities to serve your family. 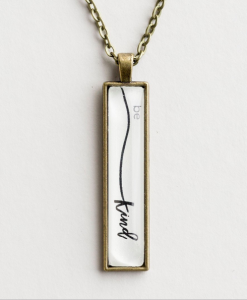 Irritations that stem from people being so human and imperfect are a catalyst for you to remember everyone is fighting a battle, and this is your chance be kind, to live the gospel by your response. We aren’t always able to control our circumstances or the obstacles and opportunities that come our way, but we can control our response. That’s powerful. 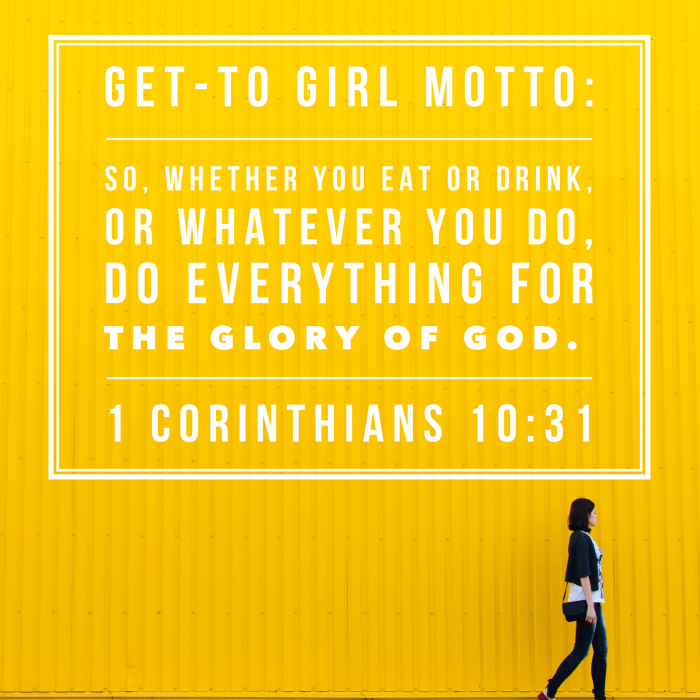 To me, the essence of being a Get-to Girl is 1 Corinthians 10:31: So, whether you eat or drink, or whatever you do, do everything for the glory of God. (CSB) Every move you make, including the attitude that companions action, can be offered to the glory of God. Should be done for the glory of God. It’s one thing when we’re facing opportunity or favorable circumstance; that’s when it’s easy. But there have been seasons when my life feels out of control, when a situation is bearing down, or relationships that matter to me are fractured, or grief feels unshakable, or I don’t know what else…. Knowing I can choose how I respond gives me at least a modicum of control, which is incredibly encouraging and empowering. This is much more than turning a frown upside down. It’s an intentional decision to frame your life and everything within it in light of The Light. Even if “Get-to” isn’t your word of the year, will you join me? 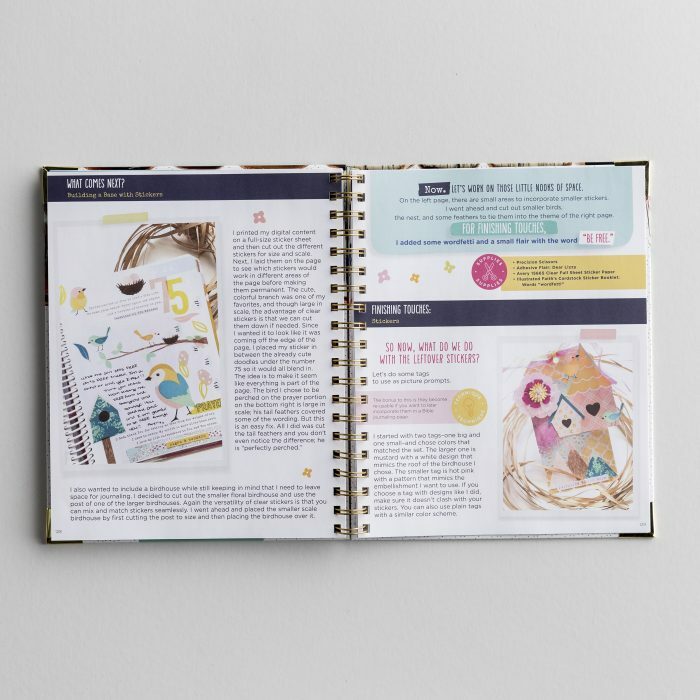 Today, DaySpring is releasing A Workbook Guide to Bible Journaling, “filled with fun techniques for painting, hand lettering, stickering, and stamping…” and I’m here to tell you, SO MUCH ENCOURAGEMENT FOR THE NEWBIE BIBLE JOURNALER. But the content is substantial enough to offer the long-time journaler plenty of new tips and ideas. 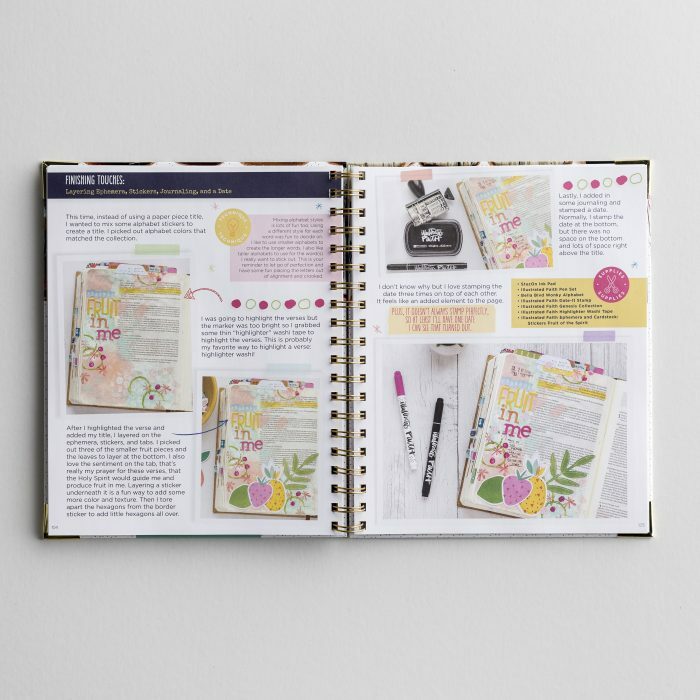 If you’ve wanted to try your hand at Bible journaling but didn’t have a clue where to start, consider this a master class featuring Shanna Noel and others at a bargain price. 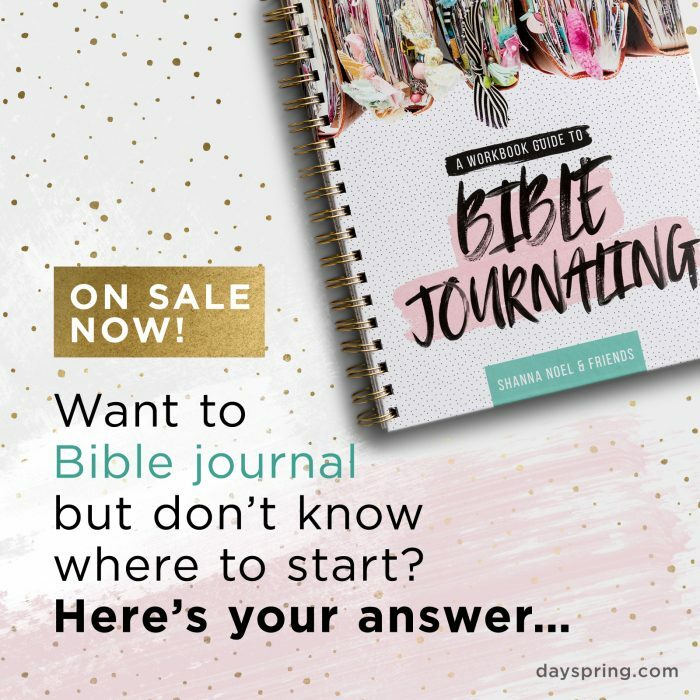 The first 600 people who order a copy will also get a free set of two pens, perfect for Bible journaling. and what better way than sharing this happy little story right here? To say I’m not getting out much these days is no understatement. If I staple my rear to a chair in front of my laptop, I figure eventually the words will come. I’m doing my part as best I can, begging God to lead and inspire me to write the parts of my story that will encourage and extend hope to readers and bring glory and honor to Him. That’s my target; may it be so. Yesterday, we found ourselves needing to complete a little home improvement project, thanks to an opportunity that left us little choice otherwise. I decided to tag along with Tad when he headed to our local big box hardware store, wanting to spend time with him but also happy for any reason to get out of the house. I may or may not have also been motivated for a chance for a little retail therapy; one of my favorite discount shops is right next door. Though Tad loathes those kinds of stores, he indulged me a visit. His simple plan was to circle the parking lot until he found a nice shady spot under a tree to wait. This is the love born of 30-plus years of marriage, finding a compromise with which we’re both satisfied. It was ridiculous, really. I didn’t need anything, I just wanted to look at all the pretty things. I mean, if something begged me to buy it, I would’ve been happy to oblige, but I wasn’t planning on it…I just wanted to lookie-lookie. Even imaginary retail therapy works wonders. Wandering aimlessly but blissfully happy, I meandered up and down the aisles, ever-mindful of the time. Since Tad was basically a human amoeba floating in a hot asphalt parking lot sea, I moved quicker than I might have otherwise. About that time, I stumbled across some darling Rae Dunn tableware. Gah–she is an evil, evil temptress, and her creations are kryptonite to me. I want everything she makes. Clever word art is one of my love languages, all the better when it’s pretty and on something useful. I was lost in thought, exercising admirable restraint while silently explaining to myself why I did not need to buy any of the things, when my subconsciousness heard something not yet detectable to my conscious brain. If you know me at all, you know I speak imaginary French, and J’adore is one of my oft-used phrases. Somewhere in the back of my head, I heard it again and thought, That sounds like something I would say…. Slowly snapping out of my fog, I turned to see one of my very best friends doing her level best to get my attention. We haven’t seen each other in ages, and she had to miss an opportunity just the other day to join a small group we’re a part of, to gather and finally catch up with life after being apart most of the summer. We squealed and hugged like school girls while her teenage daughter smiled (laughed?) at us. Right there in the housewares section of Marshalls, we had ourselves a Divine Moment. This is how I feel loved and deeply valued: when I’m known so well a friend speaks to me in Imaginary French. It is in ordinary moments like that I sense the presence of God Himself. The “random” timing of needing to replace a kitchen faucet coupled with me taking advantage of ten minutes of retail therapy; and being okay with Tad waiting in a parking lot because he didn’t want to come inside rather than managing his happiness. Or put another way, recognizing my need for a sliver of self care, and accepting Tad’s willingness to do what he wanted while I did what I wanted. Except in this case, what I wanted and what I needed were two different things. OF COURSE, if I knew my friend was fooling around in Marshalls, I would’ve said, “Let me run in and hug Leigh’s neck.” I didn’t know she was there, but God did, and in His kind and generous ways, He gave us a little visit. I’m convinced of it. 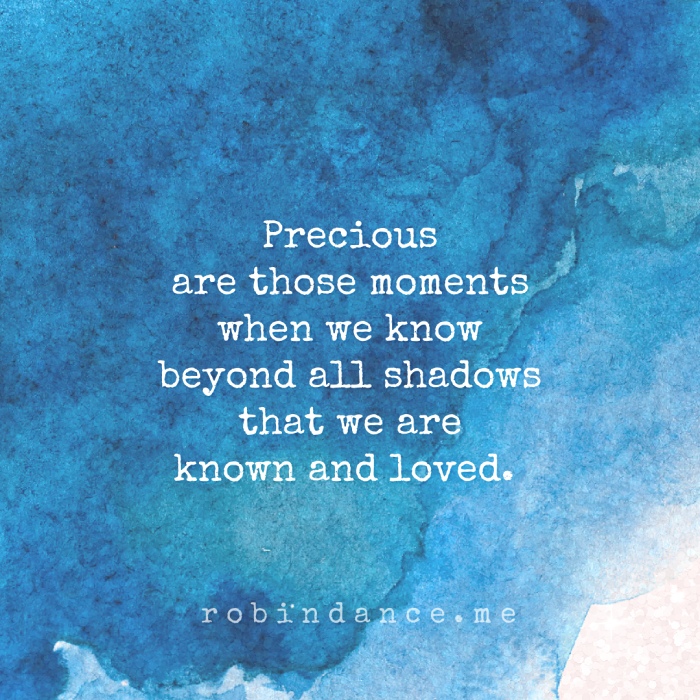 Precious are those moments when we know beyond all shadows that we are known and loved. Praise God for the Light by which we’re able to see both. If you’re interested in joining a band of prayer warriors to carry me through the last six weeks of book writing, please click here for more information. I’d love to have a few friends who’ll faithfully walk alongside me to the end. I’ll only be sending out a few updates between now and then, but prayers are welcome anytime and often <3. I couldn’t take my eyes off of him. His skin was the color of summer and youth, beautiful and smooth and the stuff of a 1970-something Coppertone ad, minus a black Boykin Spaniel. This wasn’t his first day at the pool. He couldn’t have been much older than three. His head barely reached the top of the diving board. To reach the platform he had to crawl up the stairs. This one whose smile was permanent fixture already understood joie de vivre. Fearless and free and fueled by adrenaline, he went off the board a dozen times. Increasing courage quickened his pace. He shifted the aim of a spotlight he wasn’t even aware existed. “Hey, watch my Dad!” he called out to the others when his father mounted the stairs. His face beamed awaiting the show, his eyes twinkling love, admiration, and joy. His dad did a one and a half gainer with marginal success. Olympic gold doesn’t come close. 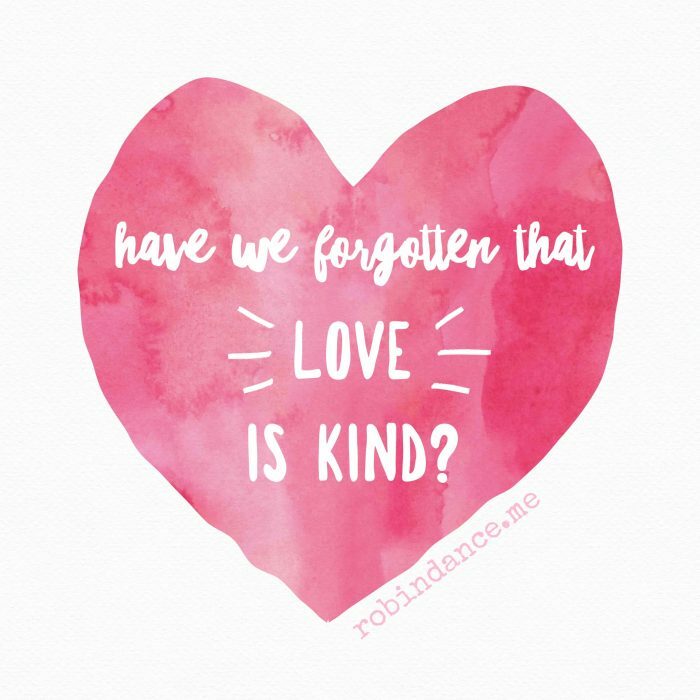 Have We Forgotten That Love Is Kind? It bears all things, believes all things, hopes all things, endures all things. It should never be a surprise when lost people behave like lost people, but it is shocking to my core when those who profess Christ act like lost people. Is it wrong to expect more? Salvation doesn’t guarantee sinlessness, so it’s not that I expect perfection from believers. But it breaks my heart to hear the vitriol spewing from opposite viewpoints of the hot-button issues of our day. Blistering lava destroys what it touches. Pick any comment thread of your favorite news outlet or open a tab for Facebook or Twitter. Why would anyone value what you have to say if it’s mean or rude? Why would I listen to anyone who pummeled me with contempt while trying to make their point? It was disconcerting to me when Tsh Oxenreider, a good friend and trusted colleague, posted a thoughtful and reasonable essay, Child-Parent Separation at the Border and What You Can Do, only to be hammered on Facebook. Those who didn’t agree with her thoughts were angry and loud; when I skimmed comments, no one who disagreed seemed kind. Recently I was startled by the effect of wearing my Kindness is Golden tee shirt: strangers talked to me. 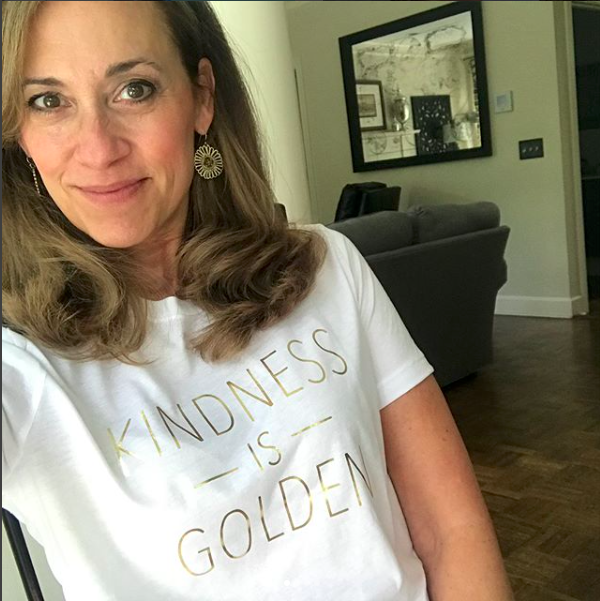 No lie, half a dozen people initiated a conversation with me about what it says, telling me why they agreed with the sentiment, why we need more kindness, or even about similar tee shirts they own. It was weird. Now, granted, I was in a place where I encountered more people than usual (an airport and then hotel lobby with lots of folks taking advantage of a free continental breakfast), but it was interesting to me so many different people (diverse men and women) approached me. Kindness is powerful because kindness is an incarnation of love. When you lead with love, I will listen to you. You have instant credibility with me. When you lead with love, as manifested in kindness, it tells me that you value me, you care about others, you’re listening as well as speaking, and what you have to say warrants my listening…even if I don’t agree. When you are hostile, antagonistic, or condescending, the effect is la-la-la (fingers in ears) I-can’t-hear-you. I don’t even mean to do that; it’s a by-product of being disrespected. Loved people love people. Could it be that many of us are simply forgetting how dearly we’re loved? It sends me to my knees…. Dear God, help me remember love is kind. Slay my fleshly ways that I might walk by the Spirit and bear fruit. I affiliate-linked to my tee shirt since folks wondered where I got it…and when I saw the necklace above, I HAD to include it :). I have a love/hate relationship with social media. On one hand, I’m convinced our lives were better without it overall. We had fewer friends, sure, but they were real life flesh and blood humans who would show up in person at your back door with a meal or a paintbrush or a hug depending on your need at the moment. We trudged to the library and navigated a card catalog to research anything and we had to buy magazines to catch up on the newest fashion or home design trends. Our houses had a whole lot more color before all the home décor and DIYer instagrammers showed us over and over again how beautiful stark white could be. (It is a mystery to me how they can photograph the same room a thousand ways and we like it every time.) You knew what adult America was doing at 6pm and 11pm every night, and if anything happened after that, you could read the news in next morning’s paper, delivered right to your front door. On the other hand, we never have to be dumb or ignorant for very long. We hear immediately when a Royal goes into labor, gives birth, reveal’s the new little prince’s name. We know the nanosecond a celebrity dies (except for Abe Vigoda who never could make up his mind) as Facebookers or Twitterers race to the internets to offer their public condolences, a thinly veiled ruse to be first in letting you know how well they’re connected, which always strikes me as funny. And it is cool to engage with people you admire, to have an inside glimpse into their behind-the-scenes lives. And sometimes you make a real connection that translates to real life and geography doesn’t really matter. Social media has it’s lovely sides, too. What we see or read can inspire us to go and do likewise. 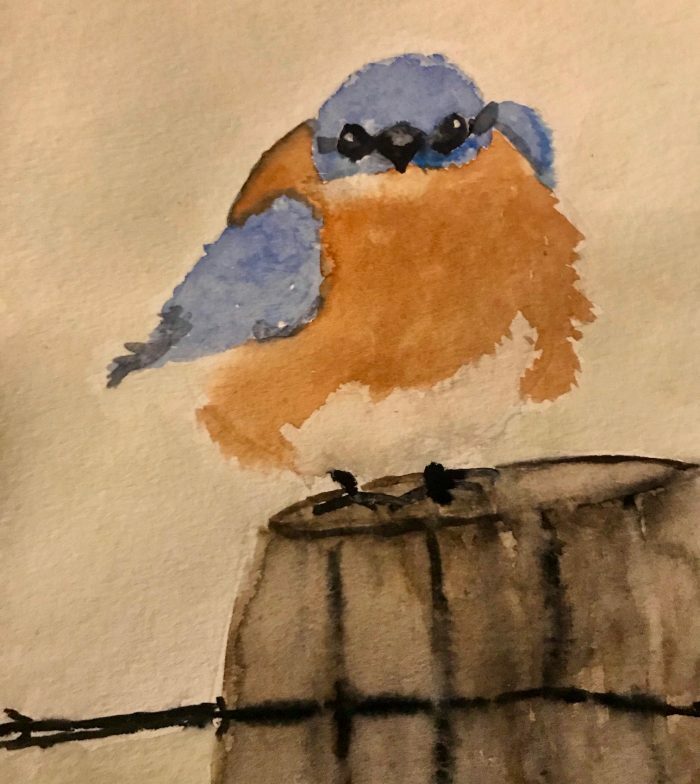 Recently, a real life friend of mine I haven’t seen face to face in forever began posting images of watercolors she painted. Oh…my…her work was beautiful and I would have guessed she was an art major before becoming a full time mama. When I asked if she was taking classes, she admitted she was just trying something new. Slap me naked and hide my clothes–girlfriend just unearthed an incredible gift. And here’s the beauty: Rebekah inspired me to try something new because she tried something new. Right after this, our church hosted a two-night water color class. I signed up immediately. With low expectations, high hopes, and a few butterflies fluttering around my stomach, I walked into class. The first night we were instructed what to paint (a landscape), but the second night we could choose on our own. 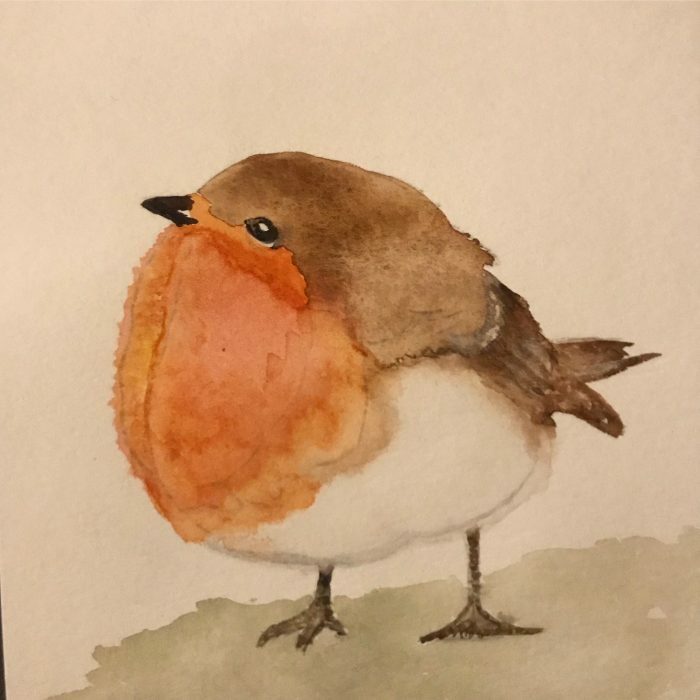 I knew exactly what I wanted to paint: fat birds, like my friend, Rebekah. While my little creations were far from perfect, I absolutely love both! Watching them come to life and at least resemble what I was going for thrilled me. Starting with a blank page and swirling a paintbrush into a little color you create something from nothing. I begged Rebekah to send me an original, and I meant it. I would have bought one (I love having my friends’ art on the wall). When she asked for my address I crossed my fingers and yesterday I received her prize: Fat Robin’s pretty cousin! We must’ve drawn inspiration from the same image, and looking at the differences between her painting and mine, I learned a few things. 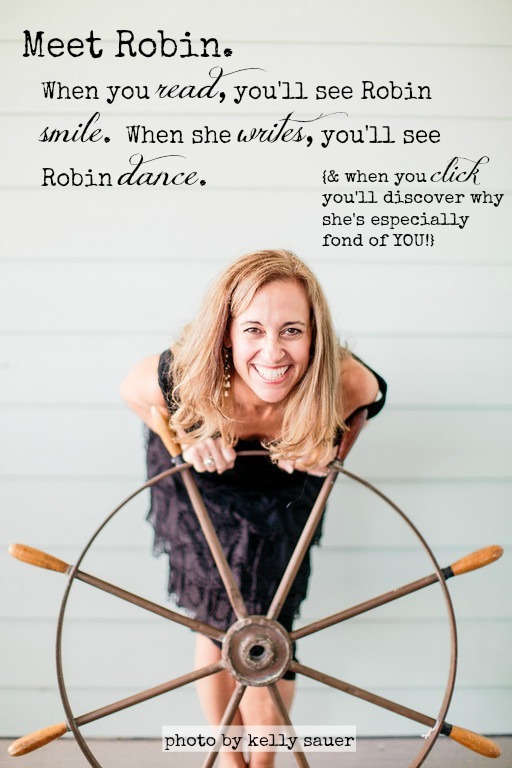 Again, Rebekah is teaching and inspiring me by being herself and doing something she loves! If that isn’t a challenge for One Year 365 Opportunities, I don’t know what is. Don’t miss the important takeaway: if Rebekah hadn’t tried something new herself, when would I have tried my hand at watercolor? I would’ve missed out on a delight of my heart, a creative opportunity that feeds my soul. 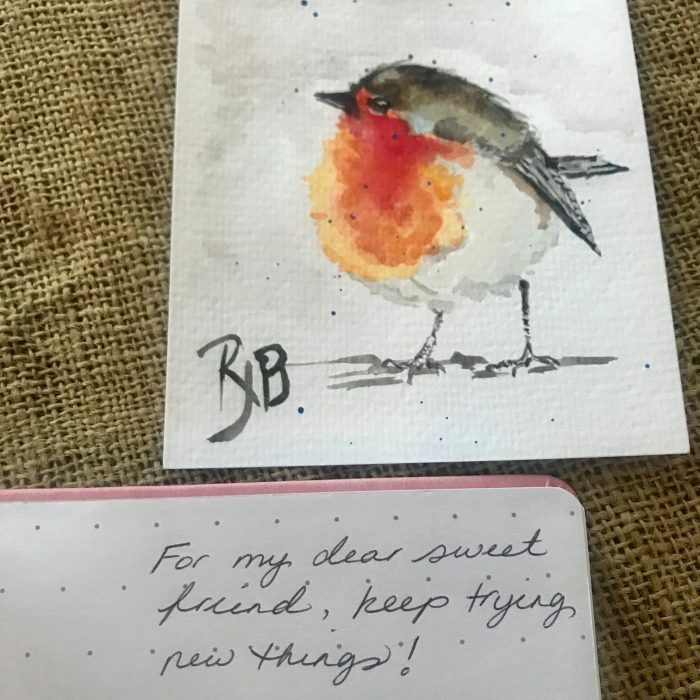 By pursuing a new thing, a new passion, my sweet friend inspired me. Sometimes inspiration begets inspiration. This is when I love social media: Rebekah and I haven’t seen each other since I moved from Chattanooga five years ago (I don’t think?) but we’re able to stay connected through Instagram. Her friendship continues to be a blessing. You have no idea who you’re inspiring just by being you. And if someone has inspired you by simply being who they are? Tell them! Green and inexperienced, I was recruited to step into the role of marketing director for a local retirement community. 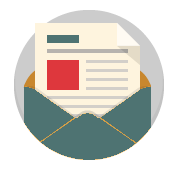 My education combined with a love and natural propensity for those senior than me far outweighed my managerial skillset, and only days after I was hired I found myself in the position of needing to hire a new sales associate. Because I hadn’t interviewed many people at that time – okay, any people – I read what I could could get my hands on about best interviewing practices and compiled a list of basic questions. Plus, I had been interviewed a dozen or more times, so there was that. Sifting through a competitive pool of applicants, I selected three people to interview. More than anything I was trying to find a good fit for the role and someone with whom I felt comfortable. We would be working closely together. I would go on to hire Mary Jane, over 20 years my senior. Time would soon tell she was an excellent choice–professional, empathetic, and, man, she could close a deal. Considering I’m writing about a conversation that took place over 25 years ago, it’s interesting to hear how a interview answer impacted me in such profound ways. 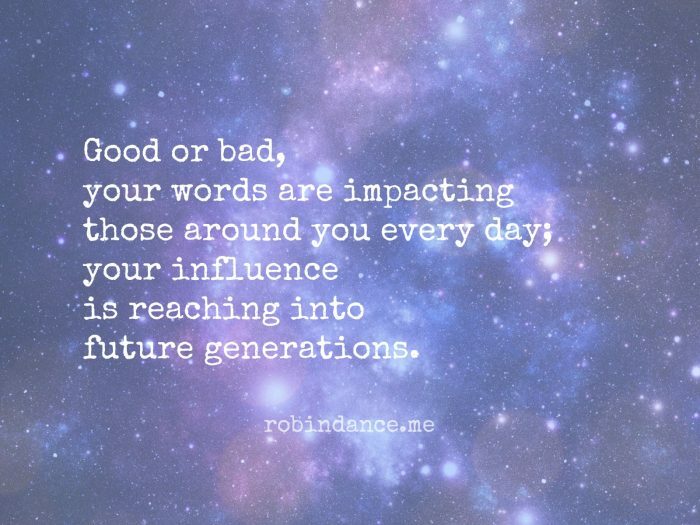 Do keep reading Your Influence Matters at the Art of Simple today, and be sure to tell me your thoughts or if YOU remember something someone said forever ago that influences you to this day.